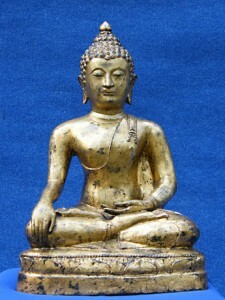 There is an extensive amount of information on Buddhism at Buddhasculptures.org. Some Buddha statues are actually based on Bodhisattvas, people could have passed to Nirvana, but instead chose to remain in this world out of compassion for other human beings. The Avalokitesvara’s main purpose is to listen to the cries for help from those in trouble and provide them with aid. He is the protector from danger and his sacrifice symbolizes infinite compassion, the sharing of mankind’s misery and a willingness to help those in distress. The eight arms symbolize his reaching out with compassion to save the world. The famous Chinese view of Avalokitesvara is a women known as Kuan Yin (or Kwan Yin). We have a large selection of Kuan Yin Statues in the asian gallery. A Chinese monk named Ho Tai is widely referred to by non-Buddhists as the “laughing Buddha” or “happy Buddha.” Many believe that he is an incarnation of a Buddha who will appear in the future and might properly be called a bodhisattva.